Speedway is located in Indiana. Speedway, Indiana has a population of 11,812. Speedway is less family-centric than the surrounding county with 23.71% of the households containing married families with children. The county average for households married with children is 25.68%. The median household income in Speedway, Indiana is $41,531. The median household income for the surrounding county is $45,347 compared to the national median of $50,935. The median age of people living in Speedway is 37.8 years. The average high temperature in July is 85 degrees, with an average low temperature in January of 19.1 degrees. The average rainfall is approximately 40.6 inches per year, with 24.8 inches of snow per year. No weather information available. Turn down the volume on your speakers because it can occasionally get a little LOUD in Speedway, Indiana what with all those racing machines around. Surprisingly the town of Speedway was named after the Indianapolis Motor Speedway, NOT the other way around. The Indianapolis Motor Speedway ran its first races in 1909, with the first 500-mile race, at that time called “International Sweepstakes,” held in 1911. These days, they still race the Indianapolis 500 for the IRL Indycar series, but they’ve added NASCAR’s Brickyard 400 and the RedBull Indianapolis MotoGP. But this isn’t about the Indianapolis Motor Speedway, is it? This is about the Town of Speedway. Officially incorporated fifteen years after that first 500-miler (in 1926), the town around the track was meant to be a city of the future, of innovation and testing for the automobile. Think of it as an early EPCOT, but for cars. They wanted this Speedway – the town – to be as hospitable to the auto-mobile as it could. At a time when most cities’ streets were paved with brick, including the Motor Speedway’s track, this town paved their roads with asphalt. And most of the homes in town were the first around to have garages to house their cars. Yeah – believe it or not, people back then actually kept cars in their garages! Silly people. Cars are for the street. Garages are for our unused exercise equipment. Today, Speedway remains a city of the future due to its popularity as a home for many racing teams and technology providers to the racing industry. 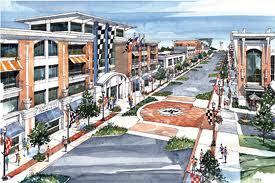 The town of Speedway, within which the entire 559 acres of the Indianapolis Motor Speedway is located. It sits in west Marion County, just a few miles from downtown Indianapolis and is one of only four towns not part of the countywide consolidation called Uni-Gov from the ‘70s. This town of nearly 13,000 residents has its own town council, police department, fire department, street department, parks and recreation department, water and wastewater utilities, school system and public library. Many of the town’s areas have completed, or are undergoing renovations that celebrate its racing heritage and retain a very nice touch of local flavor. Interested in Speedway, maybe even in hanging out with race fans a few times a year? Let’s find out more!